Definition at line 14 of file Random.h. Definition at line 26 of file Random.cc. Definition at line 31 of file Random.cc. Definition at line 36 of file Random.cc. Definition at line 21 of file Random.cc. Definition at line 120 of file Random.cc. Definition at line 46 of file Random.cc. Definition at line 104 of file Random.cc. References data, debugs, ACL::name, and pattern. Definition at line 61 of file Random.cc. References a, data, DBG_CRITICAL, DBG_IMPORTANT, DBG_PARSE_NOTE, debugs, min(), NULL, pattern, ConfigParser::strtokFile(), and xatoi(). Definition at line 40 of file Random.cc. Definition at line 52 of file Random.cc. Definition at line 35 of file Random.h. Definition at line 33 of file Random.h. Referenced by empty(), match(), and parse(). 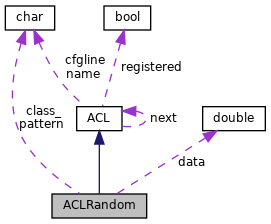 Referenced by ACL::ACL(), ACL::cacheMatchAcl(), ACL::context(), Acl::NotNode::dump(), dump_acl(), ACL::FindByName(), match(), Acl::ConnectionsEncrypted::match(), ACLDestinationIP::match(), ACL::matches(), Acl::NotNode::NotNode(), Acl::AllOf::parse(), ACL::ParseAclLine(), ACLMaxConnection::prepareForUse(), Acl::InnerNode::resumeMatchingAt(), and ACL::~ACL(). Definition at line 34 of file Random.h. Referenced by ACLRandom(), dump(), match(), and parse().